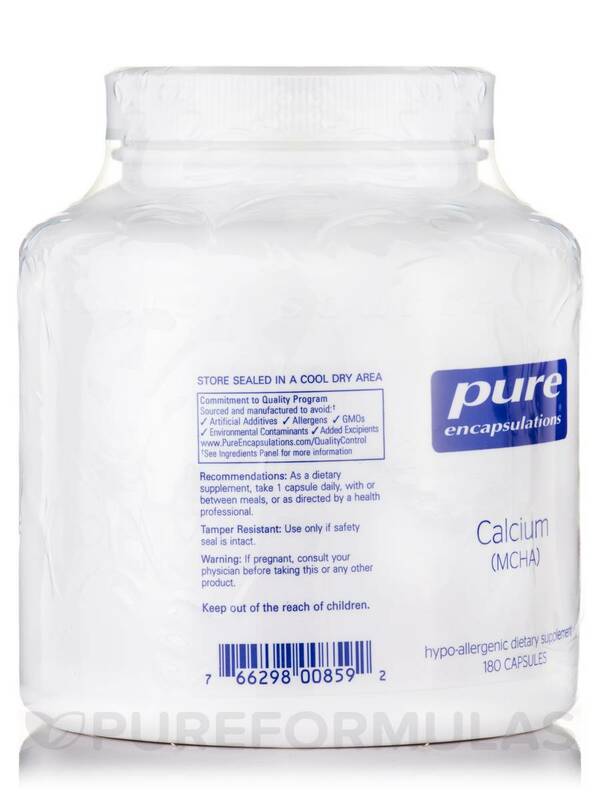 I love my Calcium MCHA by Pure Encapsulations but you no longer sell it in the larger container or 360 Caps! Please bring this back! 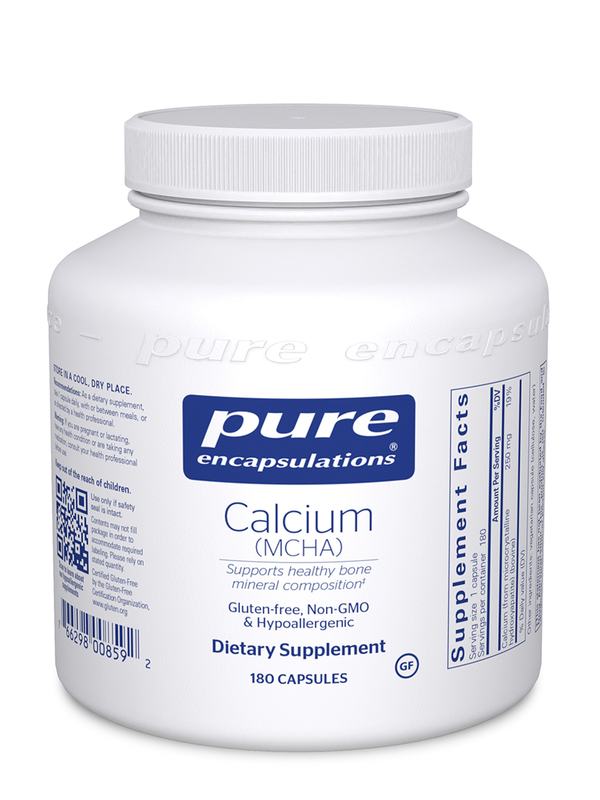 I don't eat a lot of dairy, so Calcium (MCHA) by Pure Encapsulations has been a great source of the additional calcium that I need. Started taking Calcium by Pure Encapsulations after I broke 4 ribs, really aided in the healing process and I've noticed a big difference in the overall strength of my bones when pushing through yoga. Calcium is a mineral well known for its potential to help build strong bones and teeth. Since it is also needed for essential bodily functions involving the nervous system‚ muscles‚ hormones‚ and communication between cells‚ your body will take it from bone matter if there isn't enough present in the blood stream. This can lead to weakened bones that break more easily‚ possibly resulting in falls. Good dietary sources of calcium include dairy products such as milk‚ yogurt‚ and‚ cheese; dark green‚ leafy vegetables also contain it. However‚ your body may not always be able to properly utilize the calcium in foods. 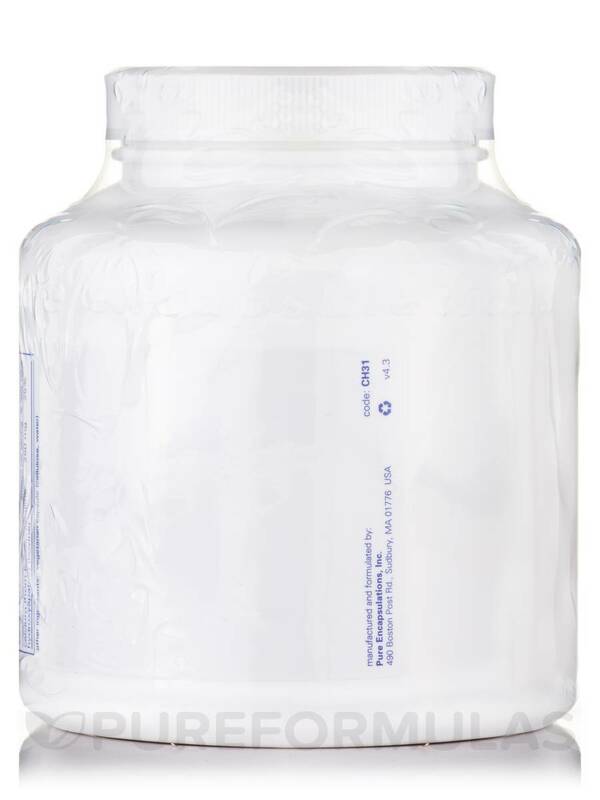 A unique supplement like Pure Encapsulations' Calcium (MCHA) provides Calcium microcrystalline hydroxyapatite. Calcium microcrystalline hydroxyapatite is a calcium compound that may be more effective than the nutrient alone. Hydroxyapatite makes up about half of your bone mass. MCHA is a highly bioavailable bovine calcium compound derived from pesticide-free and pasture-fed cows from Australia and New Zealand‚ which contains residues of bone matrix‚ proteins‚ and glycosaminoglycans. It also provides natural ratios of minerals. This support for bone mineral composition promotes a strong skeleton. Your bones tend to need additional support as you age‚ since the majority of your bone mass has been formed by your early 20s. In addition to the elderly‚ post-menopausal women--as well as people of Asian or Caucasian descent--are most susceptible to bone loss. 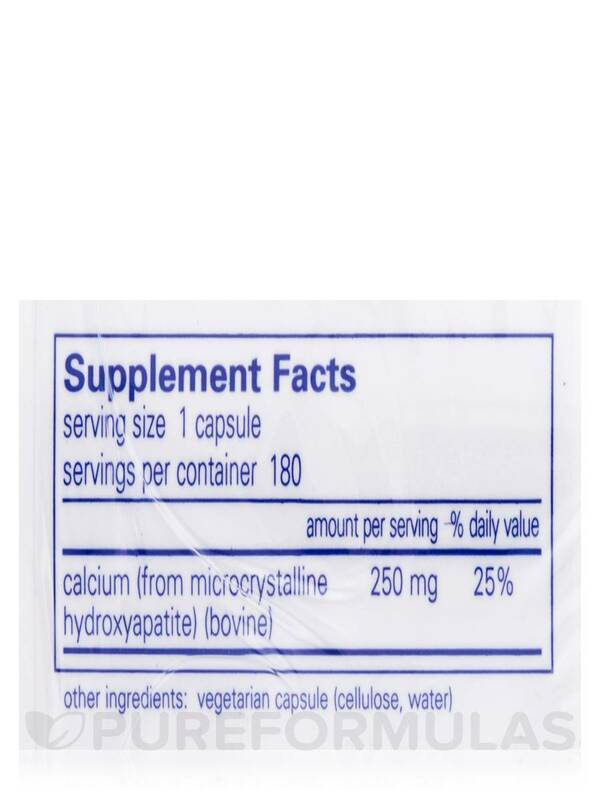 Take one capsule per day to promote bone building with 250 milligrams of MCHA‚ either with or between meals. 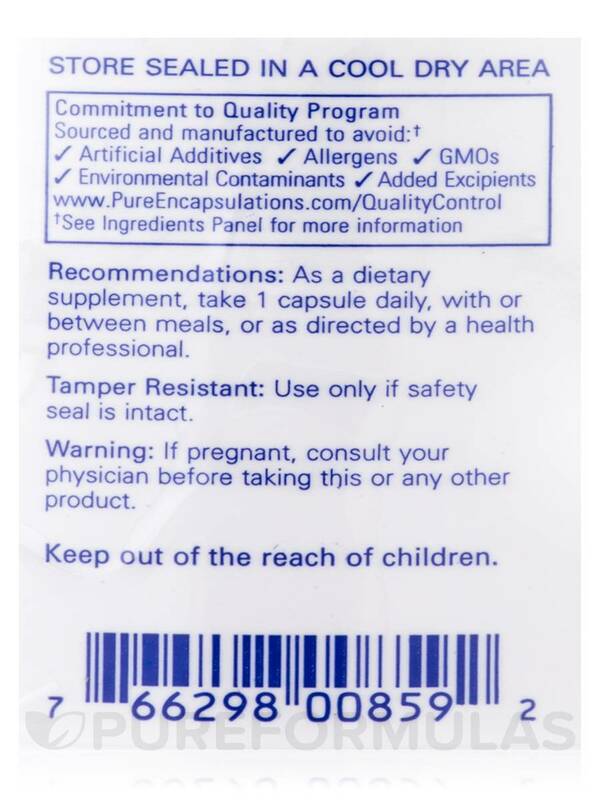 At the recommended dosage‚ each 180-capsule bottle of Calcium (MCHA) by Pure Encapsulations should last for about six months. Dexa scores prove the benefits of Calcium by Pure Encapsulations. Natural supplement to bone strength. Great source of extra calcium. My naturopath told me I needed to take these Calcium (MCHA) by Pure Encapsulations in order to treat my osteopenia and osteoporosis. It is great for bone health and is a natural way of strengthening my bones without added chemicals or sugars. Helps with my bone loss and muscle cramps along with the Magnesium. Love the product but like the larger size and lower price. The order came quick and I'm taking it now. I like the big container which makes it easy to get the calcium out. Capsule, I would rather it not be a capsule. Be careful with calcium (MCHA) you can become constipated if you take too much. I have reviewed many products but have not gotten any promised reward point. Is just one capsule daily enough to help the progression of osteoporosis? Hi Carol, we apologize but here at PureFormulas, we cannot make recommendations for our customers because there is so much to take into consideration when doing so. Everyone breaks down, absorbs, and reacts to nutrients differently, and only your healthcare practitioner, that is familiar with your needs, would be able to make a recommendation that is the best for you.